These features will eventually be added to the main stream kernel. Wed Aug 23 11:23:26 EDT 2006 Original code drop. "Security options->Enable access key retention support"
"File systems->Network File Systems->Secure RPC Keyring Support (EXPERIMENTAL)"
Also available as separate patches with comments for developers. You must use "--enable-mount" when configuring nfs-utils because the mount program within nfs-utils is not yet built by default. The Kerberos patch is not necessary for basic user access to work. However, access on a thread- or process-level requires the thread- or process- level Kerberos credentials cache. The mount program uses process-level credentials. utils/mount/mount.nfs has been modified to obtain Kerberos credentials for a krb5[ip] mount. This mount pgm must be used, otherwise gssd will not find credentials to negotiate a context for the mount. Users must currently run utils/gssd/nfslogin in order to tell gssd where their credentials are in order to successfully access filesystems mounted with Kerberos. It is assumed that the pam module will be modified to make the necessary call to do this automatically upon login. The /etc/exports file can take some new options: sec= and refer=. Our SECINFO implementation requires that each export under the server pseudo-filesystem that has different security have a unique fsid. So, if a server exports multiple directories from the same partition, the export option fisd=X must be used. Our SECINFO implementation also requires that the server pseudofilesystem root exports the union of the security flavors of its leafs. If your distribution does not have a keyutils package, you can find it here. Note that the keyutils package needs to be installed prior to building Kerberos with the keyring credentials cache feature. Be sure to check your client's /etc/gssapi_mech.conf libgssapi_krb5.so path to ensure it points to the new library. After applying the patch, run ./src/util/reconf to regenerate configure files before building the code. In addition to "KEYRING:", you can also specify "KEYRING:process:" or "KEYRING:thread:". However, these are only useful in long-running processes or threads. Specifying this via KRB5CCNAME and then running kinit will cause the credentials to be created and they will immediately go away when kinit completes. These are the "hacker" tools, commonly used to demonstrate vulnerabilities in NFSv3. We are extending them to do the same in NFSv4. The tools work with auth_sys mounts but are completely defeated by auth_krb. See the Readme files for build and usage instructions. A client that can be used to send RPCs interactively, and some tests that enable uid/gid spoofing and fh probing. This is the standard linux mount command, extended to allow mounting by file handle. This is used to bypass the export security built in to the mount protocol (v3) or pseudo-fs traversal (v4). This is a file sniffing tool from the dsniff test suite. It passively sniffs rpc traffic and reconstructs file contents. We have extended it to v4 and to display the contents in real time. 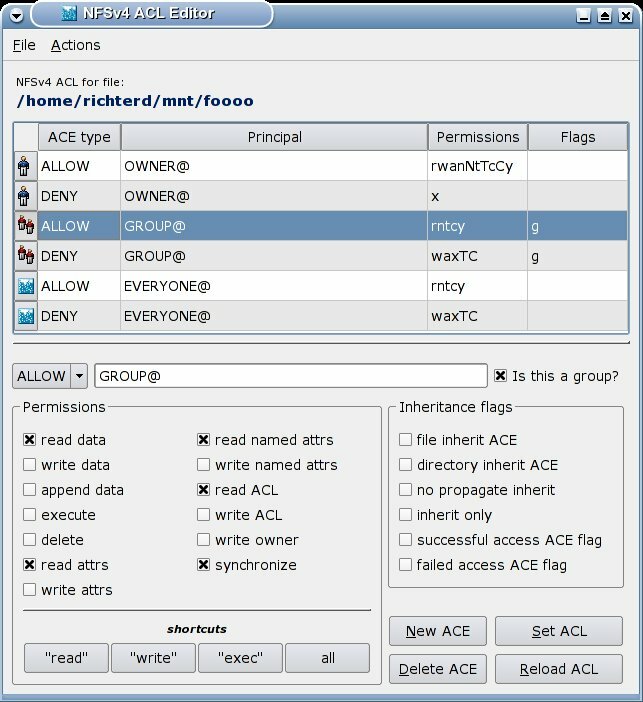 Test tools and scripts to demonstrate that acl and security identity works and is correctly configured. Command-line tools nfs4_getfacl and nfs4_setfacl, as well as a GUI (Qt-based) ACL editor (see a screenshot). We're working on bugfixes and features; please direct any email to nfsv4@linux-nfs.org. Thanks. A simple /etc/exports parser for configuration testing. A simple acl parsing and testing tool.